The word “Celt” is apparently derived from the Greek word “keltoi”, meaning “barbarian”, and is used to describe tribal societies in Iron-Age and Roman-era Europe, who spoke Celtic languages and were loosely tied by similar language, religion and cultural expression. In preparation for a workshop on Celtic Dyes that I led recently at Fishbourne Roman Palace near Chichester, I have been doing some research into the dyes that may have been used by the Celts in Iron -Age Britain (c.600BC – 50AD). The proto-Celtic culture in Europe was the Hallstatt culture (c.800BC – 450BC), named after the site of rich grave finds at Hallstatt in Austria. This culture then spread over much of Europe, into Britain, France, central Europe, the Iberian Peninsular and Northern Italy. The conditions in the Hallstatt salt mines, where the graves were discovered, meant that the textiles found there were relatively well preserved and analysis carried out on some of them gives an indication of the dyes and techniques used by the Hallstatt Celts. Woad and weld were identified on textile fragments and also tannin, although it is not possible to identify the precise source of this tannin. Other unidentified yellow dyes were also found (perhaps sawwort or chamomile) and there is a possibility that lichen purple may also have been used. The red dyes analysed are interesting – there was no trace of any of the madder-type sources of red but some indication of unidentified insect dyes, possibly Polish or Armenian cochineal, and also of kermes. Both white and naturally pigmented wool was dyed and there is evidence of over-dyeing to create further shades. The issue of mordants is problematic; iron and copper were identified on several fragments and aluminium was identified on one or two fragments. However, it is possible that these minerals were present because of contamination within the salt mine, rather than because they were intentionally used in dyeing. For my experiments I used white and naturally-coloured brown and grey wool. As I think it is unlikely that Iron-Age dyers in Britain would have had easy access to mineral alum. I decided not to use an alum mordant. Some samples were pre-treated in tannin from oak bark and others were unmordanted. The dyes I used were: weld (Reseda luteola), hedge bedstraw (Galium mollugo), lichen purple (Ochrolechia tartarea), oak bark (Quercus spp.) and woad (Isatis tinctoria). Although there was no trace of Galium spp. dyes on the Hallstatt textiles, I felt it would be historically correct to use native bedstraws in my experiments, as there is evidence from elsewhere that these plants were used for dyeing in the Iron-Age. Some samples were then over-dyed in woad and some samples were also treated in an iron-water solution after dyeing. 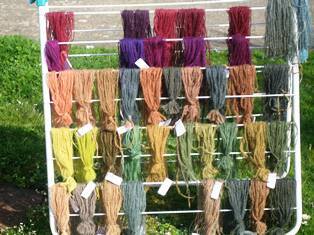 Some of the results of Celtic dye experiments. The top row shows the colours from lichen purple with vinegar added to the dye-bath (except for a couple of woad samples on the extreme right). The second row shows lichen purple colours, without vinegar added to the dye-bath. The third row shows the colours from hedge bedstraw (Galium mollugo). The fourth row shows the colours from weld (Reseda luteola) and the bottom row shows the colours from oak bark. On each row some of the samples have been over-dyed in woad. The Romans commented on the brightness of the clothing of the native Britons and the results of my experiments indicate that, even without alum as a mordant, it was certainly possible to produce bright colours in the Iron Age. The Celts also produced fabrics patterned with checks, stripes and plaids and this must have added to the impression of brightness.